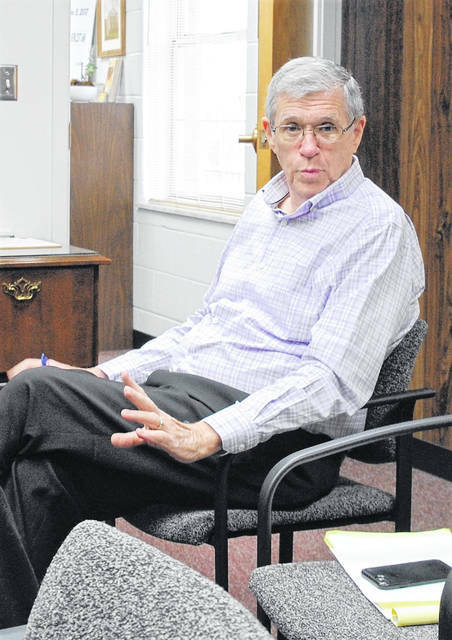 Highland County Auditor Bill Fawley described the dynamics of the audit to be conducted by the accounting firm Millhuff-Stang, CPA at Wednesday’s meeting of the Highland County commissioners. A duo of executive sessions dominated the Wednesday meeting of the Highland County Board of Commissioners as the three-member board met with officials to get more detailed information about solar power generating farms proposed to be built in southern Highland County, and to discuss the annual county budgetary audit. John Werkman of the Ohio Development Services Agency, and Robin Roush with the auditing firm Millhuff-Stang, met with commissioners behind closed doors in separate executive sessions. Commissioner Terry Britton told The Times-Gazette that he and Highland County Auditor Bill Fawley met with officials of Hecate Energy Highland LLC Tuesday concerning the proposed 300-megawatt solar power facility under discussion for construction north of Mowrystown. Commissioner Gary Abernathy said questions remain regarding property taxes, monies that will be going to school districts involved and what will be done in the future in terms of clean-up when the solar farms reach the end of their operational lifetime. He also reminded those in attendance of a public hearing scheduled for Tuesday, Feb. 19 from 6-8 p.m. at Bright Elementary School on Fair Ridge Road in Sugar Tree Ridge. The Ohio Power Siting Board hearing is to seek public input and comment about the proposed 150-megawatt Willowbrook solar power generating farm to be built on approximately 1,500 acres of land in White Oak and Concord townships in Highland County, and in Brown County’s Eagle township. Also Wednesday, Fawley explained the annual audit that county offices will be undergoing in the coming months, describing it as routine in nature, but required by law. After the pre-audit is complete, he said the auditing firm will set up a post-audit meeting with the county offices involved where they will go over their findings and make recommendations for correcting any errors or changes in policy. In other matters, a quote was accepted from Weller’s Plumbing and Heating for installation of a new dryer vent at the Highland County Dog Pound, which commissioner Jeff Duncan said was a necessary repair in order to remain compliant with insurance. In addition to approving a pair of line item budget transfer resolutions on behalf of Job & Family Services and the Highland County Board of Developmental Disabilities, payment of dues was authorized to be paid to the Highland County Family & Children First Council. There will be no commissioners meeting Monday, Feb. 18 in observance of President’s Day.